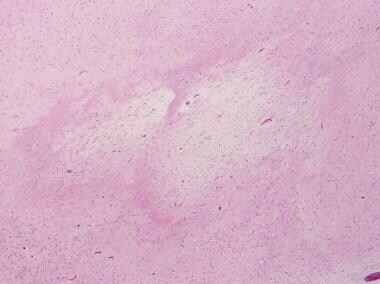 Gross appearance of acute periventricular leukomalacia. A white dot (arrow) is seen at the upper, outer angle of the lateral ventricle in this coronal brain section. 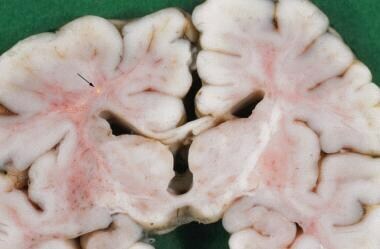 Gross appearance of older periventricular leukomalacia lesion. Cystic cavities (arrow) are seen at the upper, outer angle of the lateral ventricle. See Periventricular Leukomalacia for more details. The propensity of premature infants to cerebral ischemia is thought to be due to: (1) intrinsic vascular anatomic factors—susceptible areas within the white matter lie within arterial end zones and are thus highly vulnerable to even minor decreases in cerebral perfusion; and (2) impaired regulation of cerebral blood flow due to immaturity of intrinsic vasoregulatory mechanisms. Inflammation (including ischemia or infection-related inflammation) contributes through upregulation of cytokines and diffuse microglial activation with generation of free-radicals. Furthermore, oligodendroglial precursors, which are abundant in the white matter during this period of development, are particularly vulnerable to free-radical damage as well as to excitotoxicity. This imaging modality is commonly used for detection of cystic periventricular leukomalacia, and a characteristic progression of imaging features has been well documented. During the first week following injury, there are echogenic foci in the periventricular white matter due to local necrosis with congestion and/or hemorrhage. This is followed, during weeks 1-3, by the appearance of echolucent cysts, which correlates with cyst formation due to tissue dissolution. By 2-3 months, ventriculomegaly appears, often with disappearance of the cysts. Ultrasonography is, however, relatively insensitive for the detection of diffuse periventricular leukomalacia and, thus, for predicting cognitive disabilities. For this MRI is much more sensitive. Only a small minority of periventricular leukomalacia lesions is readily apparent macroscopically during the perinatal period, namely those lesions that fall into the category of cystic periventricular leukomalacia. The most acute lesions are not seen grossly but become apparent as white spots, approximately 2-6 mm in size, several days after the insult (see the image below). 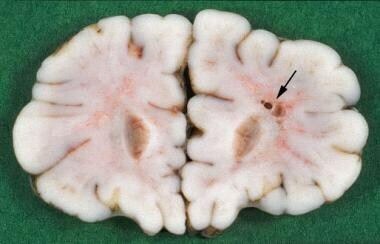 These lesions are usually found at the upper, outer angles of the lateral ventricles at the level of the foramen of Monroe, the lateral regions of the trigone and occipital horns, and anterior to the frontal horns. After several weeks these lesions cavitate, leaving cysts, which may eventually collapse to form glial scars in the same regions, as shown in the following image. With severe damage, ventriculomegaly will be apparent, and there may be an overall reduction in cerebral volume and thinning of the corpus callosum. Focal lesions of periventricular leukomalacia represent areas of coagulative necrosis that are apparent within 24 hours of the insult (see the image below). Axonal spheroids can usually be found around the lesion. Within 3-5 days, macrophages infiltrate, and by approximately 1 week, reactive astrogliosis can be seen at the margins. See the following images. 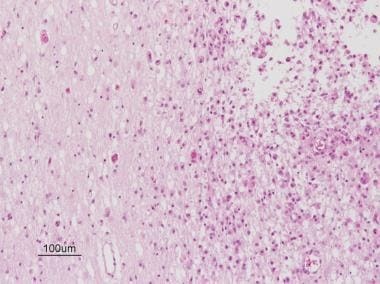 Human beta-amyloid precursor protein immunostaining can be used as a marker of damaged axons and may be helpful in highlighting more subtle focal lesions of periventricular leukomalacia. Activated microglia can be identified with antibodies to CD68 and O4, and O1 immunohistochemistry (IHC) may aid in recognizing loss of oligodendroglial precursors; more acute injury to these cells may be identified with TUNEL staining (terminal deoxynucleotidyl transferase mediated X-dUTP nick end labeling). More experimentally, markers for various cytokines and reactive oxygen species have been used to investigate the underlying pathogenesis. Volpe JJ. Brain injury in premature infants: a complex amalgam of destructive and developmental disturbances. Lancet Neurol. 2009 Jan. 8(1):110-24. [Medline]. [Full Text]. Haynes RL, van Leyen K. 12/15-lipoxygenase expression is increased in oligodendrocytes and microglia of periventricular leukomalacia. Dev Neurosci. 2013. 35(2-3):140-54. [Medline]. Pavlova MA, Krägeloh-Mann I. Limitations on the developing preterm brain: impact of periventricular white matter lesions on brain connectivity and cognition. Brain. 2013 Apr. 136:998-1011. [Medline]. 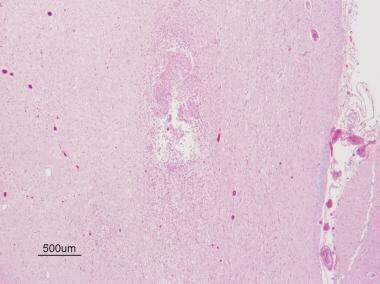 Deng W, Pleasure J, Pleasure D. Progress in periventricular leukomalacia. Arch Neurol. 2008 Oct. 65(10):1291-5. [Medline]. [Full Text]. Herzog M, Cerar LK, Sršen TP, Verdenik I, Lučovnik M. Impact of risk factors other than prematurity on periventricular leukomalacia. A population-based matched case control study. Eur J Obstet Gynecol Reprod Biol. 2015 Apr. 187:57-9. [Medline]. Falahati S, Breu M, Waickman AT, Phillips AW, Arauz EJ, Snyder S, et al. Ischemia-induced neuroinflammation is associated with disrupted development of oligodendrocyte progenitors in a model of periventricular leukomalacia. Dev Neurosci. 2013. 35(2-3):182-96. [Medline]. [Full Text]. Baier RJ. Genetics of perinatal brain injury in the preterm infant. Front Biosci. 2006 May 1. 11:1371-87. [Medline]. Neil JJ, Inder TE. Imaging perinatal brain injury in premature infants. Semin Perinatol. 2004 Dec. 28(6):433-43. [Medline]. Nosarti C, Al-Asady MH, Frangou S, Stewart AL, Rifkin L, Murray RM. Adolescents who were born very preterm have decreased brain volumes. Brain. 2002 Jul. 125:1616-23. [Medline]. Melhem ER, Hoon AH Jr, Ferrucci JT Jr, Quinn CB, Reinhardt EM, Demetrides SW, et al. Periventricular leukomalacia: relationship between lateral ventricular volume on brain MR images and severity of cognitive and motor impairment. Radiology. 2000 Jan. 214(1):199-204. [Medline]. Wang S, Fan G, Xu K, Wang C. Potential of diffusion tensor MR imaging in the assessment of cognitive impairments in children with periventricular leukomalacia born preterm. Eur J Radiol. 2013 Jan. 82(1):158-64. [Medline]. Ferriero DM. Neonatal brain injury. N Engl J Med. 2004 Nov 4. 351(19):1985-95. [Medline]. Valkama AM, Pääkkö EL, Vainionpää LK, Lanning FP, Ilkko EA, Koivisto ME. Magnetic resonance imaging at term and neuromotor outcome in preterm infants. Acta Paediatr. 2000 Mar. 89(3):348-55. [Medline]. Logitharajah P, Rutherford MA, Cowan FM. Hypoxic-ischemic encephalopathy in preterm infants: antecedent factors, brain imaging, and outcome. Pediatr Res. 2009 Aug. 66(2):222-9. [Medline].